Annuals, 4-36 cm. 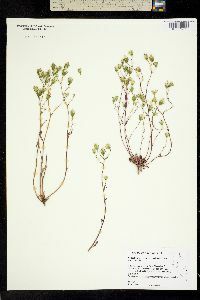 Stems 1-5, erect or ascending, branched mostly distally, glabrous. Cauline leaves: proximal oblanceolate to lance-linear, sometimes pinnately lobed, not fleshy, ultimate margins usually dentate, faces glabrous; distal reduced (margins 2-4-dentate near bases or entire). Calyculi of 5-12, lance-deltate to lanceolate bractlets, hyaline margins 0.05-0.2 mm. Involucres narrowly campanulate, 4-8+ × 2-4+ mm. Phyllaries 8-15+ in 2+ series, lance-linear to linear, ± equal, hyaline margins 0.05-0.3 mm wide, abaxial faces glabrous. Receptacles not bristly. Florets 19-67); corollas pale yellow, 4-7.4 mm; outer ligules exserted 1-3 mm. Cypselae fusiform or prismatic, 1.2-1.8 mm, ribs extending to apices, 5 more prominent than others; persistent pappi of 15-24+, needlelike teeth plus 1 bristle. Pollen 70-100% 3-porate, mean 25 µm. 2n = 14. Flowering Mar-Jun. 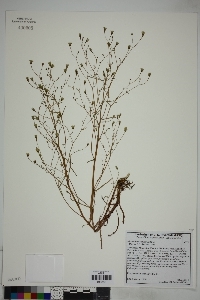 Cleared areas (burns, slides), usually chaparral, rarely margins of creosote bush shrub; 20-1500 m; Calif.; Mexico (Baja California); introduced, South America (Argentina, Chile). Malacothrix clevelandii grows in northwestern California, Sierra Nevada foothills, San Joaquin Valley, central western California, and northern Channel Islands (Santa Rosa Island).